I know I just posted a Chinese New Year NOTD just awhile back, but hey, since Chinese New Year comes only once a year, why not do another one? 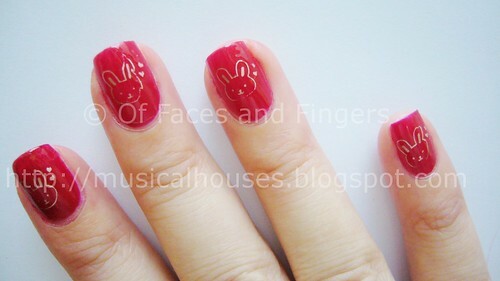 This time, I have cute little rabbits on my mani, you know, because it's the year of the rabbit! The absolutely adorable kawaii rabbit imprint is, of course, thanks to the wonders of Konad! I'm using plate S10, and it's full of kawaii animals. There's a rabbit, a cow, a cat, a bear, a dog, and so on. 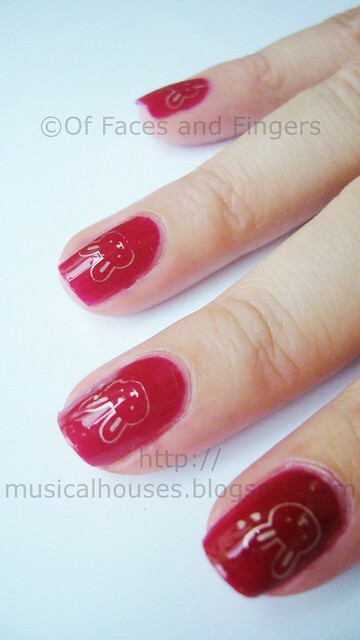 Very cute, if you ever want to do a zoo-inspired mani. The polishes were different this time, because after the glitter of the last CNY (Chinese New Year) NOTD, I decided I wanted this one to be a creme. So the base was a colour from the Face Shop's Nail Talk range, RD302. The first coat produces a pinky-red colour not unlike Benefit's Benetint, but in nail polish form. The second coat produces the primary straight-up red you see in the photos. It also comes in a very kawaii bottle, although the bottle is quite tiny. The konad colour was China Glaze Hi-Tek, a gorgeous orangey-gold chrome that is absolutely beautiful for konading. I love the China Glaze Khromes, and if you're a konader, you need the entire Khrome collection, since they all konad very nicely. As you can see from the photo, my konading skills are obviously quite lousy - there's a konad fail on some of the fingers. Oops. But still, my mistakes don't detract from how cute the rabbits are! I love the manicure! Happy New Year! I agree; these are so cute. I just got the gold china glaze nail lacquer (I love it). This is soooooooooooo cute! Happy New Year (belated! ).